You need to take extra special care of your certified diamond stud earring. If you want the earring to maintain a new look then you cannot afford to take it for granted. 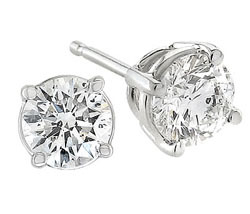 A certified diamond stud earring is as valuable as any other expensive piece of jewelry you own. If you want it to shine and retain its luster – so that even your children can enjoy wearing and owning it then it is important to follow some simple yet effective steps to look after it. Since you have invested so much money and time in selecting your diamonds, it is a good idea to have it cleaned professionally, at least once a year. Professionals use chemicals and high-tech instruments to clean the diamonds which lay people, such as us, cannot do. While they clean the diamonds, professional cleaners also check the strength of the prongs and ensure that they are not bent, loose, or weak. The prongs hold the diamonds in place and ensure that they do not fall off inadvertently. Visit a jeweler at least once a year to keep your certified diamond stud earring sparkling. While you may have your diamonds cleaned by a professional, it is also imperative that in between visits you manage to take the time out to clean the jewelry yourself. Use warm, soapy water with a mild or a very diluted liquid detergent. Brush your jewelry gently with an old toothbrush to wash off the grime and dirt from the edges of your certified diamond stud earring. It pays to use firm, sweeping strokes that will clean stubborn dirt without damaging the jewelry. You can also use commercial products that are specially created to clean diamonds. If you can regularly wash your certified diamond stud earring at home and visit a professional cleaner once a year then you will be assured of clean, sparkling diamonds that look as good as new. It helps to avoid wearing expensive jewelry while you do outdoor or heavy work such as picnicking or gardening. Your certified diamond stud earring can be chipped, cracked, scratched or you may even lose it. And once that happens, you will have learnt this lesson the hard way. Such expensive jewelry is meant to be worn for a few hours – while you are partying or celebrating indoors. Never store studs squished together in one tiny box. While a diamond is the hardest substance we know of, it can still damage another diamond. And scratched jewelry loses its original value and aesthetic appeal. If you have stored such jewelry together, you will notice that they tend to become entangled with each other. Try to keep each piece in its own box – the box can be the original one in which it was bought or gifted. You can also purchase small boxes and place each item in its own box. At the very least, try to wrap each piece separately in tissue or velvet. If you foresee that you need to take off your earrings, carry a small box in your bag, take off your earrings and place it in the box. Always remember to place the box back in your handbag securely, preferably within a zipped pouch. If you remember to follow these simple steps then your certified diamond stud earring will surely dazzle for infinity.